SOUTHINGTON - For the Southington softball team this season, Kara Zazzaro will be the key player if the Blue Knights make a postseason run. The Iona-bound pitcher showed off her abilities in Southington’s season-opening win against Bristol Eastern Monday with a complete-game shutout, allowing just two hits. With key contributors from last year’s team, Maggie Scafariello and Michelle Woodruff, graduated and in college, Zazzaro’s performance on the mound will be even more important. Southington’s offense came into the opening game looking to replace the offensive production of both Scafariello and Woodruff - both hit over .350. Scafariello led the Blue Knights in RBI with 37 and hit six homers. Woodruff was a standout on defense and caused havoc on the bases with 15 steals. Both are now playing at college, Scafariello at Adelphi University and Woodruff at the University of St. Joseph. For the younger players, the season couldn’t have gotten off to a better start facing Bristol Eastern’s star pitcher Erin Girard. 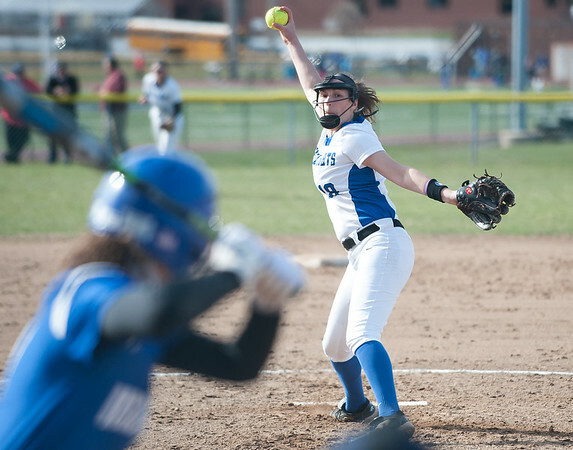 With her on the mound, Southington was set to get a good test of where they stand offensively. Callie Gendron, Abby Lamson, Malachowski and Alex Rogers looked strong for the Blue Knights in their debuts. Gendron is new to third base and had a good defensive play forcing a double play and added a hit in the game. Lamson had a pair of hits in the contest as the cleanup hitter for Southington, showing off power to all fields. Malachowski, meanwhile, made the switch to the outfield in order to have a spot in the lineup. She responded with a pair of hits. Overall, the Blue Knights combined for 13 hits in the game, impressive against a strong opposing pitcher such as Girard. For Southington this season, it’s still early but in the first game a challenge was presented to both Zazzaro and the younger players. Zazzaro shined in a pitching matchup against another ace and the younger players helped her both offensively and defensively in the game. For Zazzaro, it was a step in the right direction for a Southington group looking to get back to the Class LL finals after losing in it last season. Posted in New Britain Herald, Southington on Tuesday, 10 April 2018 21:29. Updated: Tuesday, 10 April 2018 21:32.